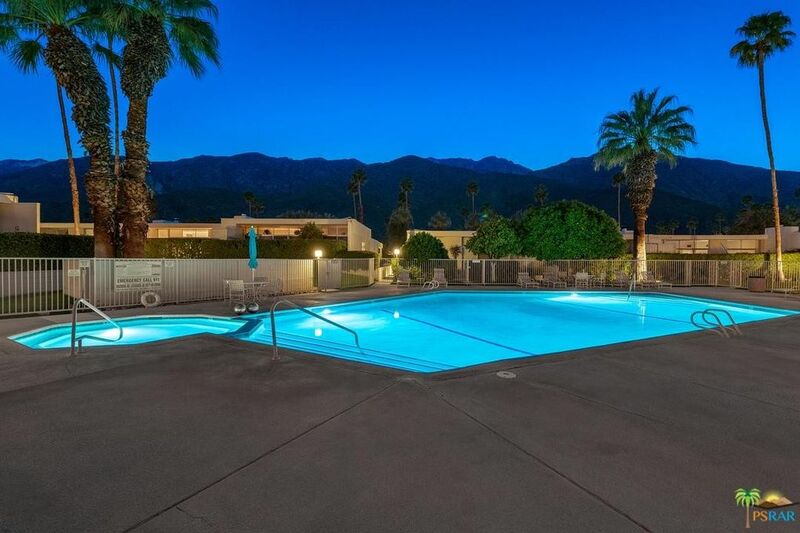 Located in the desirable South Palm Springs, Country Club Estates is a Mid-Century community designed by the acclaimed A. Quincy Jones (Sunnylands, Tennis Club Additions, Town & Country Center). Designed in 1965, this low-density community (30 units) was THE hit during Modernism Week. This exquisite 2BD/2BA, 1,486 SqFt, on land you OWN (Fee), has gone through an extensive renovation: kitchen, bathrooms, flooring, lighting, roof, HVAC, appliances, etc. This charming unit is incredibly bright due to its floor to ceiling walls of glass + the large atrium in the middle of the unit bringing lots of light in (master BD, living room, hallway, kitchen). The oversized private patio looking at incredible views of the mountains + pool area is perfect for al fresco dinners or just chill + relax. Private laundry off the Guest BD. Single level. 1 car garage adjacent to the unit. Few minutes to golf, tennis, biking + hiking trails, shopping, restaurants, downtown, museums, art galleries, and more.